Never been to a caterpillar birthday party? Well know Microgaming are bringing the party to you in this adorable 5-reel online slot featuring 100 adjustable pay lines. Make sure you bring your present when you come to this party and maybe you will get some cash in return as you play Cashapillar slot. 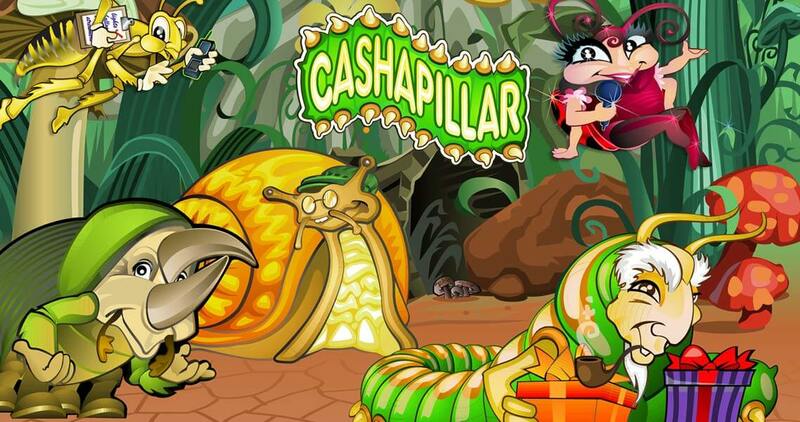 This cartoon slot game is reminiscent of a children’s cartoon or the movie ‘A Bug’s Life,’ and all the cute little characters attending the party certainly are endearing. The game opens to a backdrop of plants and leaves with mushrooms dotted around, which we assume is the landscape that the bug party will take place. On the reels, the guests are arriving. There is a ladybird, a snail, the cashapillar and his presents, a grasshopper and a beetle, all of which look ready to party. The colours are bright and engaging and the party décor is visible behind each of the characters on the reels, with bright lights twinkling for the party celebrations. Microgaming launched the first true online casino over 20 years ago and have stayed at the top of the game since, creating fantastic experiences for iGaming fans all over the world. They have used every theme and culture under the sun to create encapsulating and mesmerizing online slot games that delight fans time and time again. If you like the sound of that and what to check out some more of their games, try Beach Babes, Hot as Hades, Retor Wheels or Goblins Gold and spin the wheel today! The wild symbol in the game is the Cashapillar logo and it also acts as a multiplier. It will substitute for all symbols except the scatter. This symbol can create a wild stack symbol and it creates a win when 5 symbols appear in a line on an enabled pay line. The scatter symbol is the lucky cashapillar’s birthday bonus cake and when two or more of these appear on the reels it will complete a winning combination. When three or more cakes appear on the reels the free spins bonus will be activated. When the free spins bonus is activated, you will be awarded with 15 free spins and all wins will be tripled. During this round, free spins can be reactivated by scatters and the free spins will be added to whatever you have remaining. 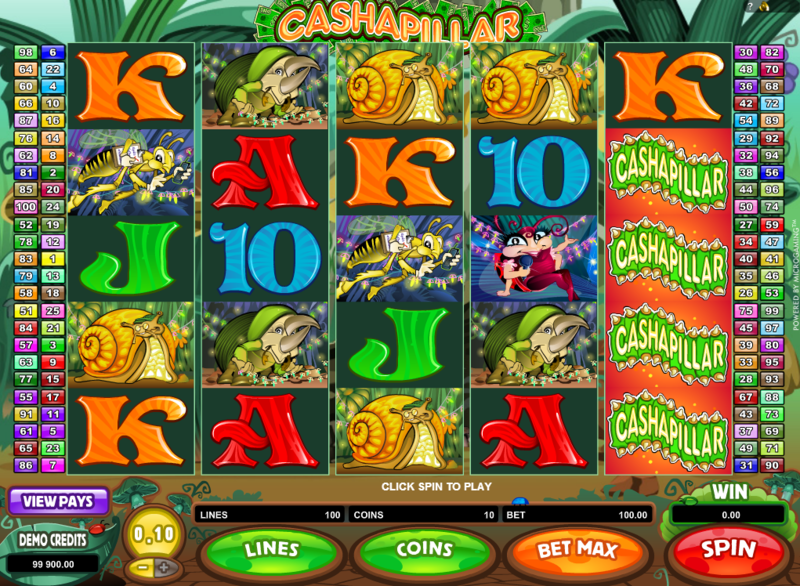 During free spins, the Cashapillar logo can award a 6x multiplier when it completes a combination. 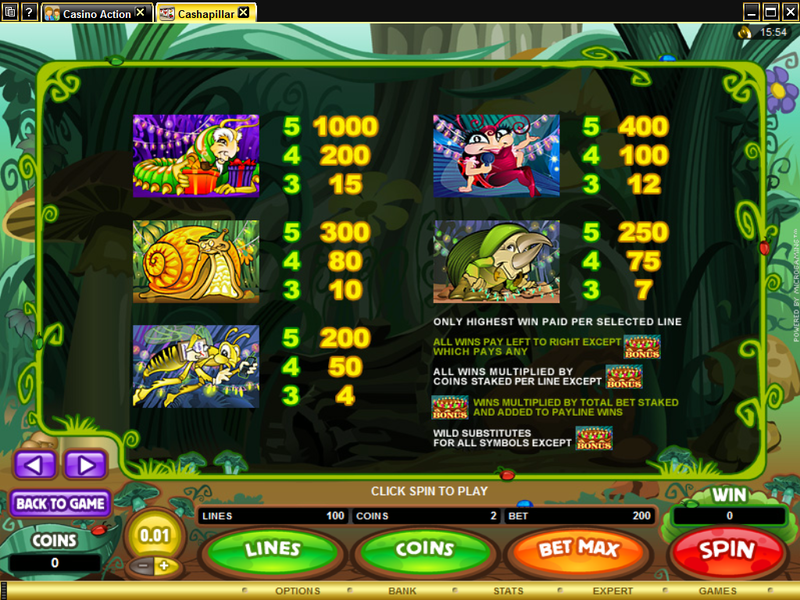 The game also features a gamble option so you can bet your winnings and try to win even more prizes. The most exciting thing about the game is that you can win up to 6 million coins when you bet max! Good luck!